Here’s a sample from Breach of Peace. 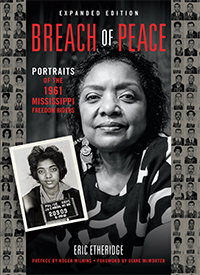 It shows a selection of the archival images that open the book, and the complete chapters on the first two groups of Riders to arrive in Jackson. Click on the pages above to go to a much larger display of this excerpt (at issu.com). I just finished reading “Breach of Peace” Wow!! I was so moved. I was thrilled that my local library in Cortland, NY had a copy. I was inspired to read it by the Feb. “Peace Calender” page by the Syracuse Cultural Workers. Not only are the stories inspiring, the new photographs are absolutely exquisite. I fell in love with these courageous men and women, and I so enjoyed seeing them from ’61 and then recently. Such grace! I’d love to go to Jackson in May!